Yesterday, as Star Wars: The Clone Wars Season 5 and the Seasons 1 to 5 Set hit stores, The DailyDot.com posted an article "Is the 'Save The Clone Wars' campaign ready to embrace 'Star Wars: Rebels'?" I think is a good article about Save The Clone Wars and the upcoming Star Wars Rebels. When the article was first published, it referred to me as the "creator of the Save The Clone Wars Internet campaign." This is not the case. 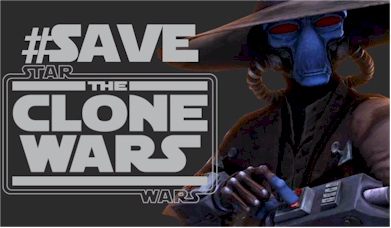 I started SaveTheCloneWars.com, its Facebook page, and its Twitter account, but if anyone is the creator of the Save The Clone Wars campaign that was Jimmy Mac from RebelForce Radio. He sounded the alarm, and he was the first, that I am aware of, to encourage fans to write to Disney and LucasFilm to Save The Clone Wars. [Update] The DailyDot.com updated the article and reworded the above phrase, which I felt was inaccurate. If you would like to check out the article, it is located at http://www.dailydot.com/fandom/lucasfilm-clone-wars-star-wars-rebels-fans.